The No. 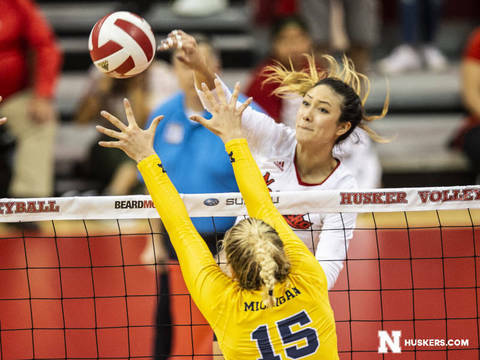 6 Nebraska volleyball team recovered from a slow start to earn a 3-1 road victory at No. 15 Michigan in front of a sold-out crowd of 1,800 at Cliff Keen Arena on Saturday night. Set 2: Stivrins combined with Foecke for a block and put down her fifth kill to put the Huskers up 6-3. Nebraska led 10-7 when Michigan went on a 3-0 run to tie the set. Sweet put the Huskers back in front, and Foecke blocked a shot to make it 12-10. Miller served NU’s second ace of the match, and Foecke tacked on a solo block for a 16-12 Husker lead. Michigan scored three straight points out of a timeout to get within 16-15, but Nebraska didn’t let the Wolverines draw even. Foecke grabbed sideout for the Huskers, and Sun terminated twice around a block by Schwarzenbach and Sweet to make it 21-17 Big Red. Foecke and Stivrins added kills down the stretch, and a block by Hames and Stivrins gave NU the 25-20 win. The Huskers were much sharper in set two, hitting .345 and holding Michigan to .184. Set 4: Foecke picked up where she left off in set three, posting three kills to lift the Huskers to a 6-3 lead. Stivrins and Sun tacked on kills before an ace by Foecke and a block by Sun and Stivrins made it 10-4 Huskers. Nebraska needed a timeout after Michigan scored the next three points to get within 10-7, and the Wolverines went ahead 13-12 after their run became a 9-2 run. Sun and Sweet got the Huskers back on top, and Schwarzenbach and Foecke added kills as the Huskers regained a 17-14 lead with a 5-1 spurt. Michigan got back within one, but Foecke continued to blast away with two more kills, and Sun dropped two kills to the floor for a 21-17 advantage. Michigan would not go away, scoring a 5-0 run to go up 22-21. Stivrins earned an important sideout for the Huskers and served an ace to make it 23-22 Huskers. Sun tooled a Michigan block for match point at 24-22, but the Wolverines fought it off with a pair of kills by Jones. Sun’s 17th kill made it 25-24 Huskers and gave Nebraska another chance at match point, and this time a block by Schwarzenbach and Sweet ended it at 26-24.